An issue that I (and most IT administrators) often hear from users is that their email in-box is full and the account has stopped working. This happens all too often but with a bit of regular “housekeeping” to clean up the mailbox, it is easily managed. If you think about it, it is no different to what we used to do with paperwork and filing cabinets when your inbox was an in tray on your desk. As a guideline, a 2 Gigabyte email account is estimated to be able to hold around 40,000 emails. Surely this should be enough for most users. This may vary to some extent if you have a lot of large attachments on the emails but even still it should be adequate. The wrong (lazy) thing to do is to just keep on increasing the size of the mailbox as all this does is prolong the point at which you inevitably have to do the clean up exercise when you finally hit the limit. Remember that the bigger the mailbox, the more work there is to do. The other important point to remember is that larger mailboxes cost extra and are usually charged on a per person per month basis. Maybe not so much of an issue if you only have one account but what if you have a number of employees! Generally, there will be a lot of email in your in-box that you don’t need to keep so just delete it after you have read it. When you delete, it goes into the “deleted” folder on the server just in case you want to recover it but you need to empty this out periodically as well. Also remember to empty your junk folder regularly after quickly checking that there are no emails that have got sent there by mistake. A good approach then is to set up a number of local folders on your PC in your email client (e.g. Microsoft Outlook), for example customer 1, customer 2, or for different departments or projects etc and then get into a routine of moving the emails you need to retain to the relevant local folder. If you are getting a lot of spam email, you can set up filters to instantly move them to your junk folder. If you are getting a lot of newsletters that you signed up for but no longer have time to read them, just unsubscribe from them. You can always sign up again later if you need to. 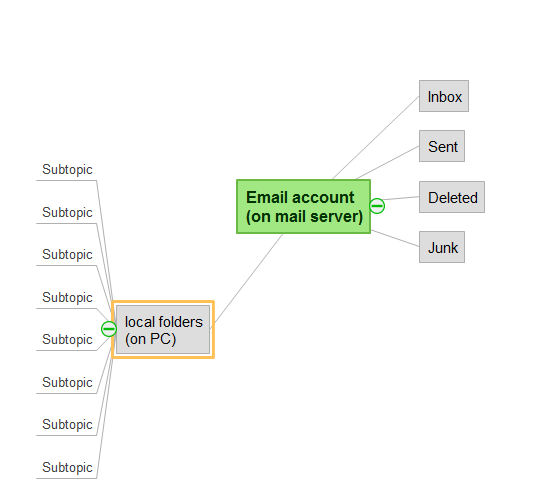 Done on a regular basis, this method keeps your email account tidy and well within it its limits and actually makes it much easier to trace back and find old emails as they are already sorted into folders. If you do it on a daily basis, it is quite easy to manage, the longer you leave it the harder it is. Most importantly, make sure that your IT guy ensures that your local email folders are included in the PC backup. I have been using this approach for several years and have never reached the limits of my email account so I know it works. next post: Are you ready for GDPR on the 25th May 2018 ?